An Irish day on Cape Cod: It began with a 5K walking race along Nantucket Sound in South Yarmouth (Cape Cod Irish Village Road Race). At the conclusion of the race we enjoyed Irish music at the Irish Village. Unfortunately, any loss to our waistlines from the race was fully counteracted by hamburgers and pints of stout. The day ended with listening to Celtic Sojourn on WGBH. That program featured a beautiful poem by Patrick Kavanagh, which is appropriate for Mother’s Day, or for remembrance on any loved one. But I don’t read the poem as being only about remembrance; it’s more about valuing the “earthiest” aspects of all our daily interactions–walking “together through the shops and stalls and markets” or among the “green oats in June.” Kavanagh reads the poem in the video below. When we lived in Dublin in 2007-08, I remember walking many times along the beautiful Grand Canal, which was near our apartment. 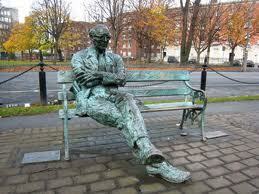 You can see a statue of Kavanagh there (“The Crank on the Bank”). It’s also shown in the slide show and below. If you were to visit Dublin, I recommend sitting beside him to contemplate the people walking by, the ever-present swans, and the stilly, greeny water. This entry was posted in Cape Cod and tagged Cape Cod, garden, Ireland, literature, nature, poetry. Bookmark the permalink.